Welcome to Day 3 of Newton's Nook February Release! 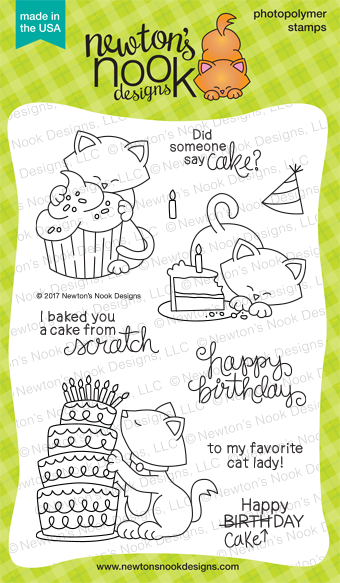 Today we are sharing the third and final stamp set being shared from this release called Newton Loves Cake! Adorable Newton is ready to help you celebrate all the special cake moments in life. 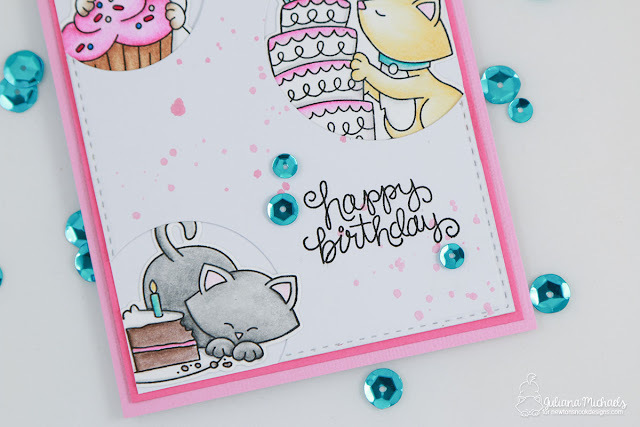 Make sure to keep reading to learn about the card I created and then how to enter for your chance to win the Newton Loves Cake Stamp set! This stamp set is seriously adorable and I couldn't decide which image I liked the best, so I choose to stamp and color all 3 of the adorable Newton images and color them each a little differently. Each image is stamped with Versafine Ink in Black Onyx and then colored with Prismacolor colored pencils. To create the peek a boo images, I used circle dies to create the openings on the white cardstock panel. Before I added the cats, I splattered a little Heidi Swapp Color Shine Ink in Pink Rose. I then tucked the die cut Newton's behind the openings and adhered them in place. The final touch was the addition of some shiny sequins. Now, onto some fun! How would you like to win the “Newton Loves Cake” Stamp Set? Leave a comment on the NND blog and each of the Design Team blogs (see list below)! The winner will be chosen at random from the collective reveal posts. Make sure to check out each of their blogs and comment for your chance to win. You will not know which blog has been chosen, so the more you comment on the better your chances are of winning! You have until Thursday February 16th at 9pm CST to comment -- winners will be announced on the NND blog post on Friday, February 17th. Beautiful card! Love the layout and colors! I love circles and cats, so this is an great card for me! Beautiful made! Lovely card, with the three different Newtons. The colors are beautiful! 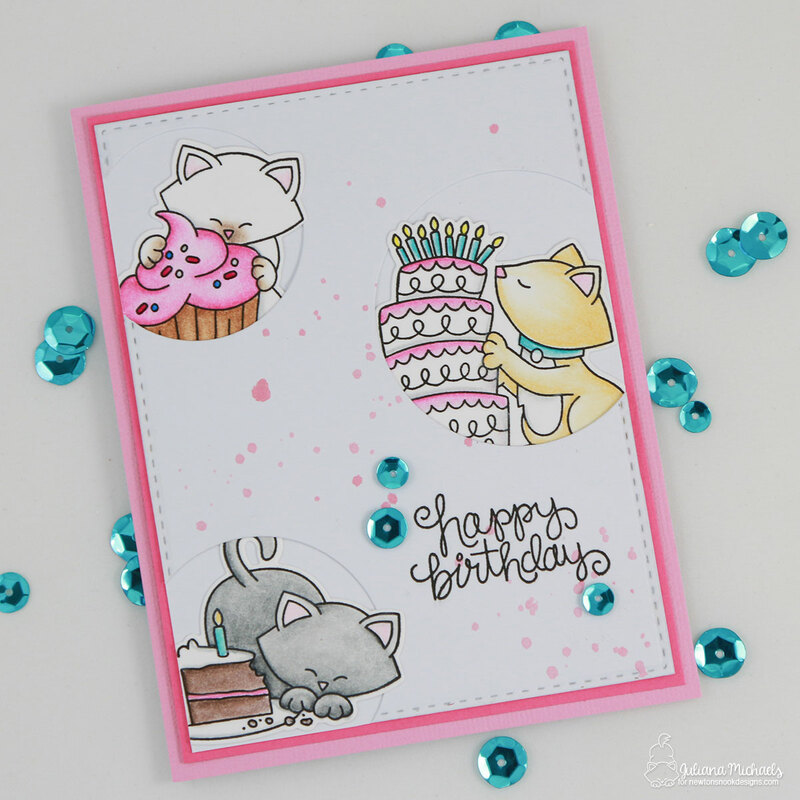 I love how you used all the stamps on one card and that peek-a-boo effect is so cute! Your card is super adorable! I love this stamp set! Such a cute card, how fun you've captured the curiosity of my cat to a T! This card is so super cute!!!! Such a fun card design and a way to use all the kitties together!! Amazing design! Turned out super sweet and cute! Love your card design! The way you have part of the stamped image sticking out of the round windows is wonderful. Great coloring!! Love your fun card with the circle windows! Great color variations of each Newton design! Love this cute stamp set! Cute cute cute! Love the color soo much! Lovely card! Adorable set! Love what you designed with it. These kitties are adorable! Love the soft, sweet colors too! I love these kitties. What a great card to showcase this set! Your card is fabulous! Using all three images is a great idea and I love how you put it all together. Oh Juliana this is so SWEET. I absolutely LOVE this set! Very cute cards, love the pink. Hope to win! Awesome card, love how you incorporated all three stamps into this card. Very cute. I like the colors and the circle design. Cute card. These stamps and dies are need to haves. I LOVE the way your images are "peeking" out of the cutouts! Really clever design. Such a sweet card, beautiful coloring with colored pencils!! Great use of all of the stams with those windows.. smart layout! Julianna, your cards as adorable!